"It's hot out here, and they expect me to speak French!" 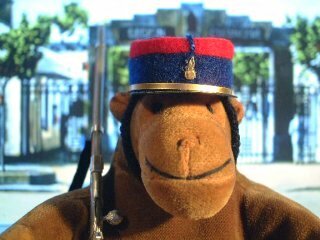 Mr Monkey didn't join the Legion Etranger to forget, he was just after another fine hat. 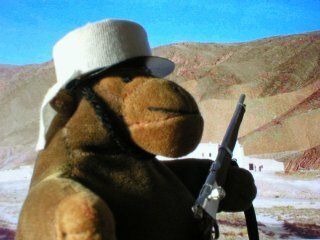 When he's guarding the Legion headquarters in Sidi-Bel-Abbes Mr Monkey's kepi is uncovered, but when he's out in the desert he adds its white cover and neck scarf. Mr Monkey's Legion kepi, reasonably accurate for the 1920's and 1930's, is made of card and felt, with coloured thread for the piping on the top, gold card for the false strap and the grenade badge, thick thread for the real strap, and black sticky plastic covering the peak. The cap cover is made from bits of old T-shirt, with a card former to make it easier to put on. And to take off, too. His Lebel rifle is constructed from balsa wood, an old biro, some silvered card, and a map pin.